you know .. I love handmade jewelry and I'm always enthusiastic about discovering new techniques and materials. 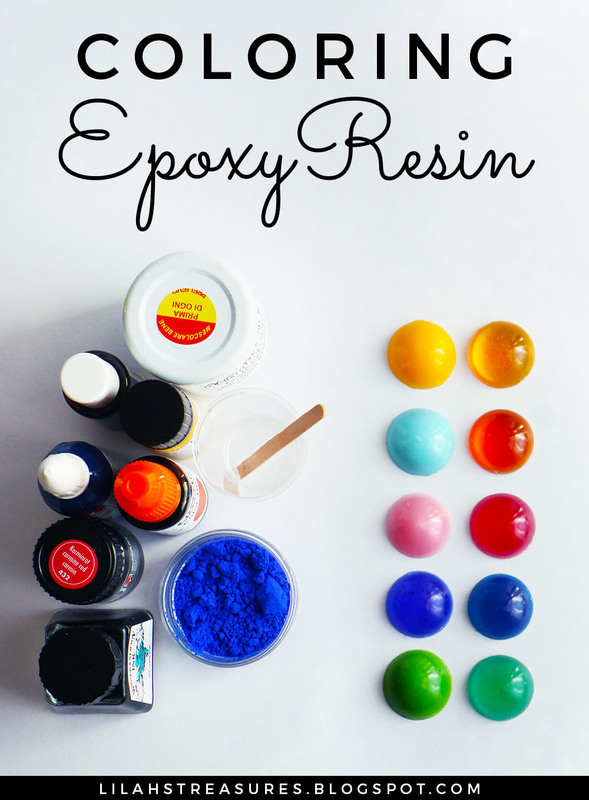 Recently I approached the magical world of epoxy casting resin, a special polymer which you can use to create stunning and glossy pieces looking as transparent as glass. The possibilities are unlimited: you can make all shapes you like by means of molds, include objects inside the resin pieces (even flowers and leaves), use colors and get an opaque or translucent appearance, depending on the effect you want to achieve. Plus, the resin stones you created are light and then comfortable to wear in jewellery pieces. To work with casting epoxy resin you should mix the exact amount of the two resin liquid components (the challenge is avoiding the air bubbles forming when you stir), pour the resin into molds, be patient and wait until it dries completely (each resin brand has its own curing time, even 72 hours). It's important to follow some precautions when working with resin, like being in a ventilated place and wearing gloves. If you would like to have farther information about "how to work with casting epoxy resin", you can get an idea by watching some tutorials (eg: this and this) on youtube, like I did before I began. I love the idea of imitating colored glass by means of resin. This would be my final goal. What experts say is that the best choice for coloring resin is to use resin specific dyes. But, from my experience, they are not so easy to find, even online (at least here, in Europe), especially the ones which keep the resin transparent effect. And It would be nice to have some alternatives. So.. not long time ago I had a very funny afternoon with my first resin experiment, and while practicing, I tried different dyes, in liquid and powder form, some of them keeping the resin transparency and other creating an opaque effect; not all were specifically formulated for resin. And I would like to show you my results here in this post. Firstly I prepared the resin. It took a bit of time to decide which resin brand to buy, and I chose the Prochima E-30 Effetto Acqua resin at the end, because it’s really recommended by italian crafters due to the water-transparency of the pieces you can get and especially because it is solvent free. 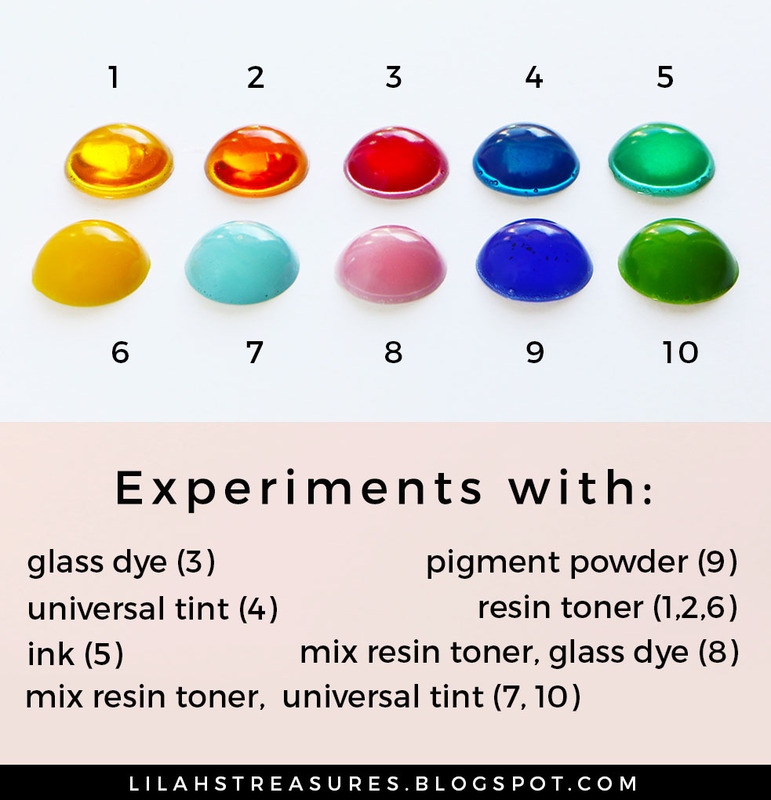 Then, I filled each of my 10 plastic cabochon molds (round shape, 2.5 cm diameter, 1.0 cm thick) with about 4 cc of resin, previously mixed with a tiny drop of colourant in a small plastic glass (I spilled the tint drop in the resin with the help of a wood stick). Note: I didn't finalize my resin cabochons (I didn’t sand and gloss them); I focused only on coloring the resin; I tried to avoid air bubbles while mixing resin and dyes, but they showed up sometimes. Generally you can buy all these colourants in well equipped paint shops, in arts and craft stores near where you live (as I did for the first two dyes in the list) or online. Mixol tints, Marabu dyes and Winsor&Newton inks are really popular and it should be easy to find them locally. The ultramarine blue powder was a gift from my dear friend Sonia, who bought this pigment in a make-up shop. Let's give a close-up look at my cabochons. As expected, resin colourants produced very good results. 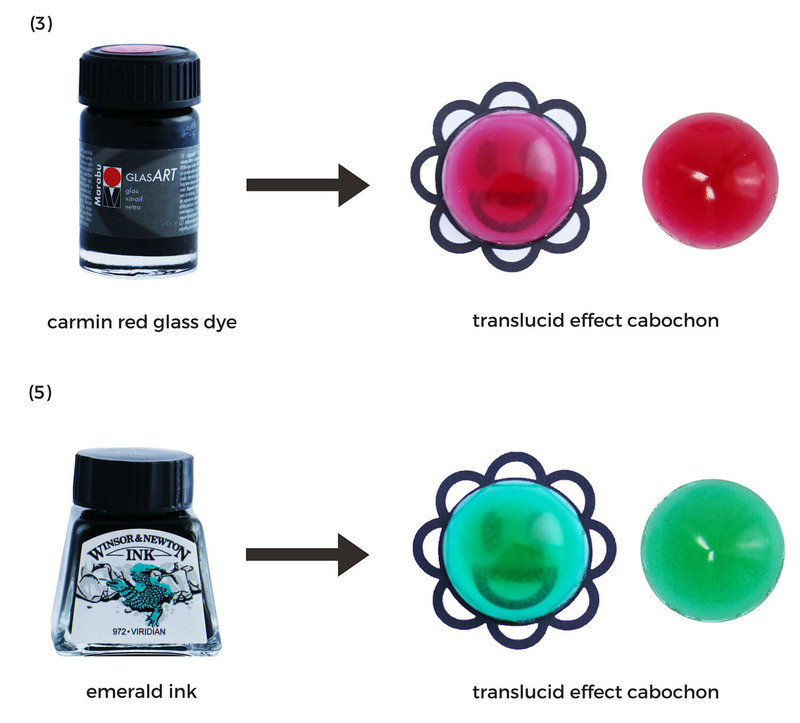 From the pictures above, we can see that the cabochons color is perfectly uniform, even when the transparent dyes were used. 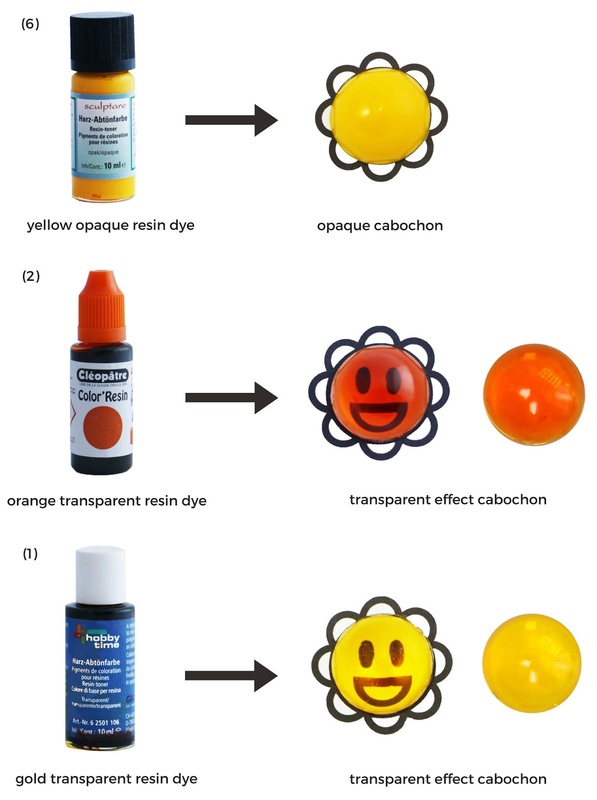 I can observe only few thin darker veinings in the orange cabochon center, produced by means of the Cléopâtre resin colourant (2), but they are almost invisible and can be useful to create special effects in some cases. The bad side of resin dyes is that they are expensive, not easy to find; there are often only few colors available, and they are mostly opaque. Although I used dyes not formulated for resin, I was happy to experience that the cabochons dried completely after the resin curing time (24 hours for my resin), and they have a perfect consistency. I observed that the color distributed uniformly in almost all cases: strange things, which I will explain later, happened only by using the emerald ink and the ultramarine blue pigment. I had great hopes to keep the resin transparency by means of the glass dye (3) and alcohol ink (5); instead I obtained two pretty pieces looking translucent. Many air bubbles showed up in both cabochons above because probably I stirred the resin and the colourants too fast; but you have to pay attention to see these imperfections, as the pieces are not transparent. I’m not sure whether there are only bubbles inside the green cabochon (5): I have the impression to see lots of very little darker dots too. If it is like so, maybe I should consider that the water based ink composition is not compatible with my resin. As a newbie, I cannot tell that for sure. Overall, I think the cabochons look beautiful and I like them. 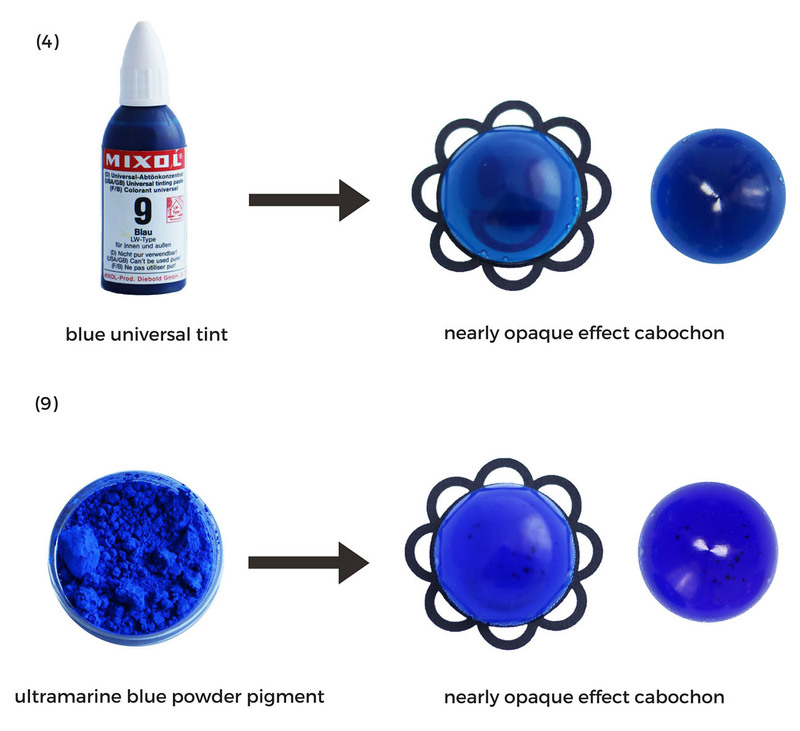 The ultramarine blue pigment (9) and the blue universal tint (4) mixtures produced almost opaque cabochons. Very little transparency, but the resulting cabochons colors were cool. I was positively surprised by the universal tint (4); I like color uniformity indeed. I’m happy because there are several Mixol colors available, and I would like to try the lighter tints as they will probably give a final translucent look when mixed with resin. About the blue pigment, you can see how beautiful is the resulting color (9), but you should mix resin and powder in the right way; due to my inexperience, I was not able to dissolve completely the pigment in the resin indeed, and you can notice some darker spots near the cabochon center (this youtube video tutorial might help in how proper mixing resin and powder pigments). Anyway, I heard that lots of crafters using powders, like oxides, micas and even eyeshadow dusts, obtain excellent results and nice effects (eg: pearlescent look). Last experiments (7), (8), (10) were focused in obtaining a completely opaque effect. And it was really easy: I simply added a little bit of opaque resin dyes to “the not for resin” tints, as you can see from the picture above. And the cabochons look really well colored. I can say I’m really satisfied with these experiments I did, and I hope you enjoyed reading this post and found valuable information helping your resin experience. As a newbie, I think I should learn lots of things about coloring resin and about resin in general. Dyes world offers lots of solutions and I wish also to try nail polishes and professional chalks in the future, as suggested in some youtube videos I watched. 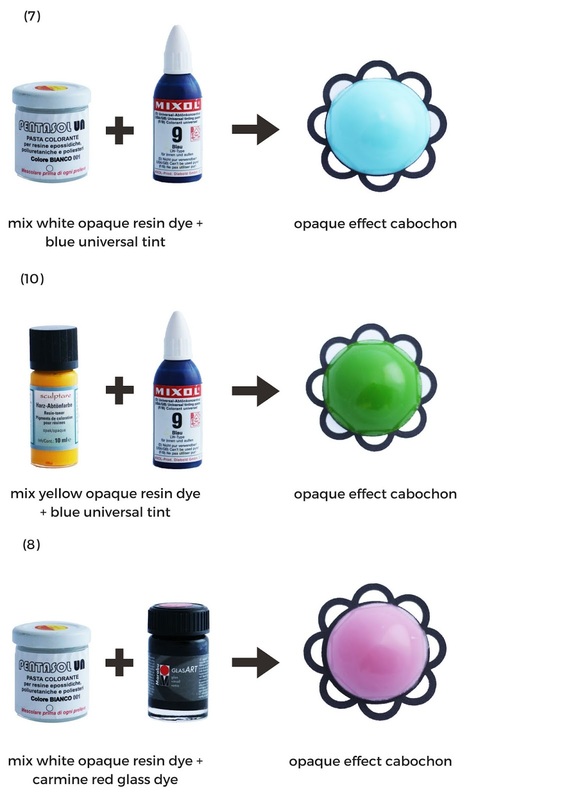 If you want to achieve a translucent or opaque effect, colourants not specifically formulated for resin can work fine, but if you need a transparency effect, you should consider to buy proper resin dyes. I will write below a list of few resin dyes brands I discovered on-line here, in Europe. And it would be fantastic and really helpful for me if you could increase this list, by adding in the comments other missing brands (from Europe as well) you know and your experience with them. Che bello seguire i tuoi esperimenti con la resina, ed è affascinante vedere come si ottengano effetti differenti con i diversi "ingredienti". Lilah, these are fantastic! I will keep your extensive post as reference for when I finally decide to make something using resin. I have bought tons of silicone molds just waiting to be turned into cabochons but I simply cannot find time.